I am having fridge problems! It’s an inconvenience and I am not happy with having to throw spoiled food away, especially when hubby and I have been working hard to figure out our spending and trying build a good budget! The good thing is this is suppose to be the weekend we go grocery shop (I am trying to go every other week, the less I go into a store, the less chance of money being spent right? ), which means most of the food in the fridge are pretty much eaten, so I do feel somewhat better about this situation. The freezer is fine, so the meat and seafood are safe, and we all know that’s where the expensive stuff are stored, whew! Drain the water from tofu package, wrap with a paper towel and set aside to drain excess water. Mix the ground pork with everything except cooking oil. Hand tear the drained tofu into small pieces, mix thoroughly with the marinated ground pork. Heat up the oil in a frying pan, when it starts to smoke, form the ground pork mixture with both hands into 10-12 separate sausage shaped patties. then carefully pan fry them in the hot oil for about 5 minutes on each side. 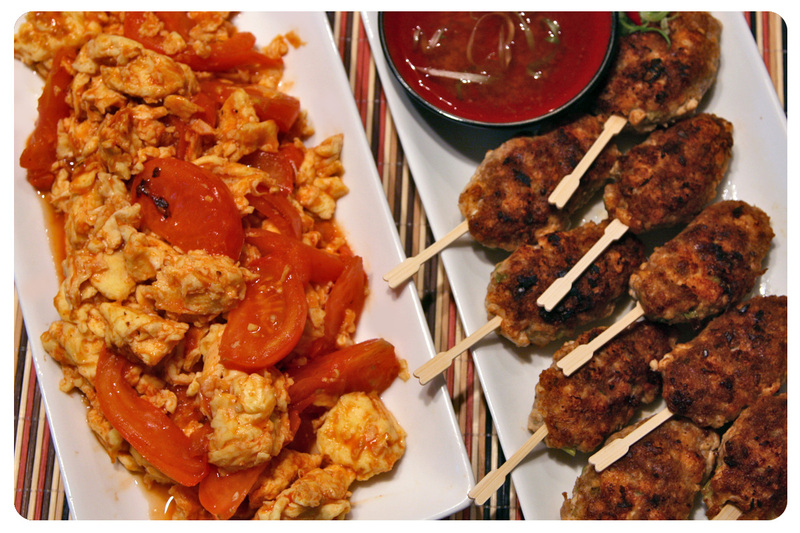 Use bamboo forks or skewers to make eating these delicious kabobs easier and fun! How delicious!!! When I first saw the title I was wondering if this was Japanese inspired dish as we do mix tofu with ground pork/chicken and make patties. Is her cookbook good? I heard about it from other blogger, and wonder how it is – I don’t own many cookbooks especially English cookbooks… These look scrumptious! And are you going to make macarons?! 😀 It’s my dream, but I think I should start making cupcakes for the first time before going to macarons haha! Thank you Nami! Yes this is definitely Japanese inspired. I’ve never thought about putting tofu and ground pork together to make delicious kabobs. So far this is the only recipe I’ve tried, and I didn’t follow her ingredients exactly, because I didn’t have all of them. I am hoping to try some more of her dishes and let you know my take on the book, so far so good! Oh what a blow with the fridge! that’s a bit like the computer going down – you forget just how difficult life can get. 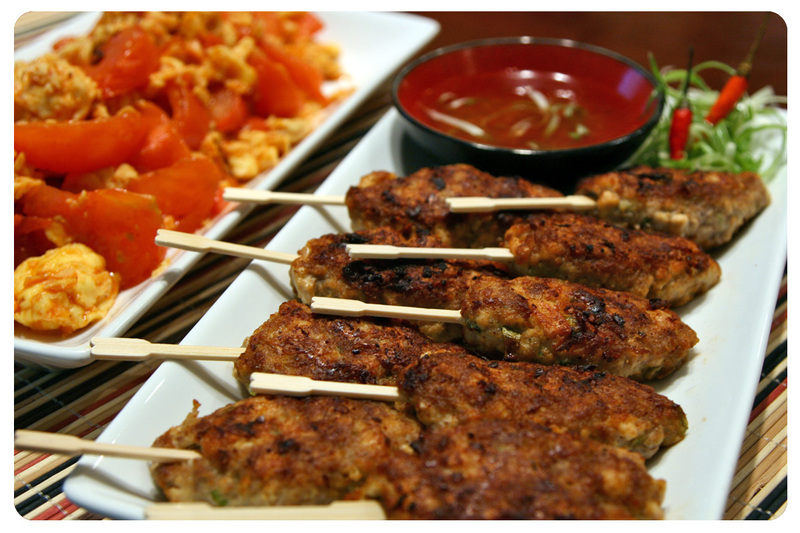 Never mind, those kebabs look really delicious, and so simple to make. I could gobble them all! thanks for the recipe, Jeno. Hi Jenny! Thank you so much for your kind words! Yes I am a bit unhappy about the fridge, because the old one we had for 9 years never gave us problems, we switched to this high tech one 18 months ago, as soon as it’s been paid off, the next month it starts to Mal-function, isn’t that ridiculous? Well I can relate…can’t make or i wouldn’t dare myself to make macarons. i know already that it will be waist of my time and ingredients LOL! 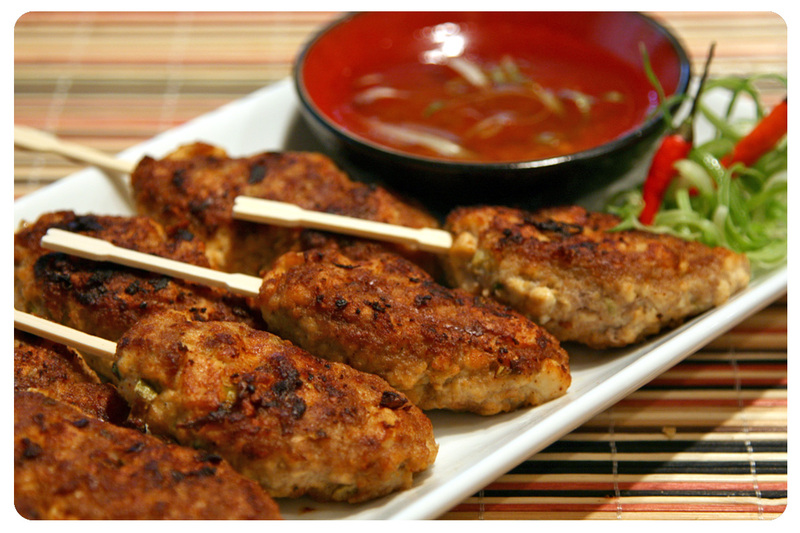 Those kebabs look amazing…I love the combination of pork with tofu..Great dinner idea! I have one book by Harumi (Harumi’s Home Cooking) and until now I have made only a few recipes but they always work (I posted once her aubergine, miso and tofu gratin, a real delight). I am in awe with your plans to make macarons. I have never attempted to try them because apparently they are not very difficult but require discipline and a good oven. I don’t have either 😉 Good luck! I keep my fingers crossed. I hope your fridge will stop bothering you… I still remember when mine started to go crazy when I put too much food at the same time and it was very hot outside. Somehow it repaired itself overnight. Hi Sissi! Thank you! For some reason I’ve never thought about mixing tofu with ground pork, but the kabobs turned out so moist, I think there’s no other way to make meat balls or patties from now on! The other dish is tomatoes with eggs, I really thought there’s a post I did a long time ago about that recipe, but for some reason I can not find it! It’s something my family LOVES to eat, super simple to make and relatively healthy (other than the large amount of eggs involved). I had to cook it because due to the fridge situation, I wanted to use up everything that might go bad. It worked out well… That’s amazing your fridge fixed itself, our car did that a couple of times, magical! Jeno, it’s incredible but I remember I have bookmarked tomatoes with eggs recipe in the Sichuan cookery book I have written about when posting steamed aubergine last week. I wonder if it’s similar to your recipe. Do you keep eggs in the fridge? I never do (my mum used to keep eggs in the fridge too, but I once met someone who never did and started to do the same; I have heard they shouldn’t be kept at very high temperature but cool room temperature is ok; I have never been ill and stumbled upon a rotten egg only once in my whole life). It saves me space in the fridge which is constantly packed. I also never put tomatoes into the fridge because I once heard a French chef say they lose their aroma and then I made an experiment and it was true! The ones I have put into the fridge vegetable part had much less aroma. Hi Sissi, those are great information!!! I remember my Mom has always put eggs in her fridge, though back at Taiwan, she used to send us to the egg farm and pick out fresh eggs for the week, their eggs are just sitting amongst the hay and at room temperature. I never knew about the tomatoes, just thought they would spoil fast if I don’t put them in the fridge. Guess it doesn’t really matter right now, since the fridge is sitting at 65 degrees, only 15 degrees lower than my room temperature, blah! Not as all ray, the ground pork and tofu binded beautifully without any help, I intent to make this dish again real soon! I tried this recipe on my family two nights ago and it was a big hit! The kids complained at first that they don’t like tofu, but once they tasted the kabobs they stopped complaining. I think the only thing I would change next time is to reduce the salt – I felt they were a bit too salty. Great recipe, thanks for sharing!